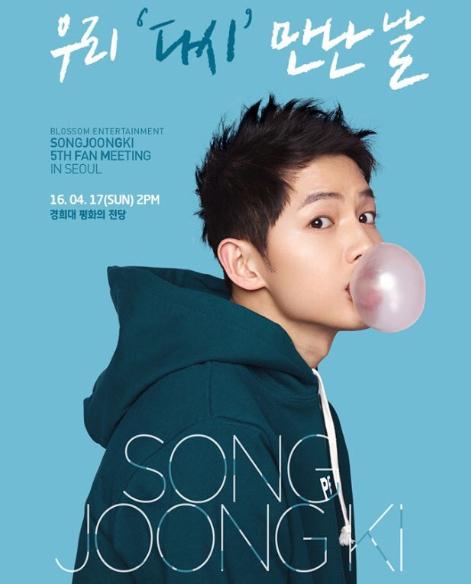 Actor Song Joong-ki kicked off his Asia fan meeting tour with “Song Joong-ki the fifth fan meeting in Seoul: the day we meet again” at the Grand Peace Hall in Kyung Hee University on Sunday. It was attended by some 4,000 fans. Tickets for the fan meeting had almost immediately sold out when they went on sale on March 31. Song’s last fan meeting was on Aug. 17, 2013, 10 days before he enlisted in the military. The fan meeting featured various events related to the KBS2 hit TV drama series “Descendants of the Sun” in which Song played the male lead Captain Yoo Si-jin. The last episode of the TV drama aired last Thursday. Three special episodes featuring highlights of the 16-part drama series are scheduled to air April 20-22 on KBS2 at 10 p.m.
Actor Park Bo-gum made a surprise guest appearance onstage at Sunday’s fan meeting. Both Song and Park are represented by Blossom Entertainment. Song will hold fan meetings in several Asian countries, including China, Taiwan, and Thailand in May and June. The next fan meeting is scheduled to be held at Thunder Dome, Muangthong Thani in Bangkok, at 6 p.m. on May 7.